A great way to help with Empty Bowls is by helping us spread the word of the event. One easy way to do this is to post flyers about the event. 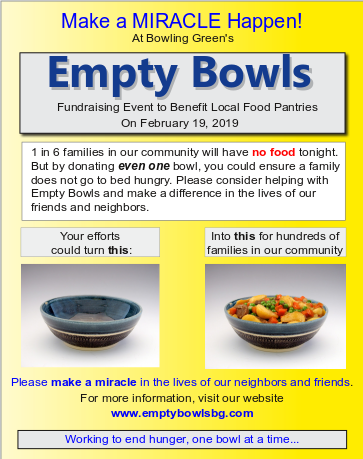 Below are images of flyers inviting people to help by donating a bowl for the upcoming event on February 19th. If you would like to post a flyer at your workplace, church, or community center, click on the image that you would like to print, and you can download a .PDF file to print on your printer.